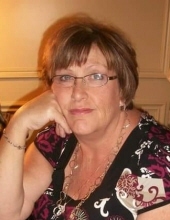 Debra Ann (Hendrickson) Brown, 60, of Waynesburg passed away Thursday, February 7, 2019 at her home. She was the wife of Joe Brown whom she married on August 8, 1975. Debra was born in Indianapolis, Indiana on June 9, 1958 to the late Roy Lee Hendrickson and Frances Lorene (Sturgeon) Burrow. Debra was a retired nurse for the Fort Logan Hospital. She was a faithful member of the Crossroads Assembly of God in Brodhead having previously served as a Sunday School teacher. She was also a former Sunday School Teacher for the Crab Orchard Church of God. Debra loved quilting, canning, cooking, working in her yard and her flower garden. with Bro. Stephen VanHook officiating. Burial will be at the Ephesus Baptist Church Cemetery. Visitation will be prior to the funeral beginning at 11:00 AM on Saturday, February 9th at McKnight Funeral Home. To send flowers or a remembrance gift to the family of Debra Ann Brown, please visit our Tribute Store. "Email Address" would like to share the life celebration of Debra Ann Brown. Click on the "link" to go to share a favorite memory or leave a condolence message for the family.